It was bound to let us down. It’s bad enough that we’ve been waiting since June for a new episode of Game of Thrones. But I am sure that many of us watched seasons 1 and 2 in the interim. I remember watching it during two weeks of torrential rain last summer in Belfast. In fact, I watched the final episode of last season prior to the premier. Maybe this colored my experience watching tonight’s episode. But it was unclear if it was setting up this season or wrapping up the last. Granted, this is fairly close to how the novels transition from one to another—though Martin does usually begin each installment with a vignette that never seems to tie in with anything at all in the pages that follow. I wanted something more tonight. Much more. Nothing really happened. 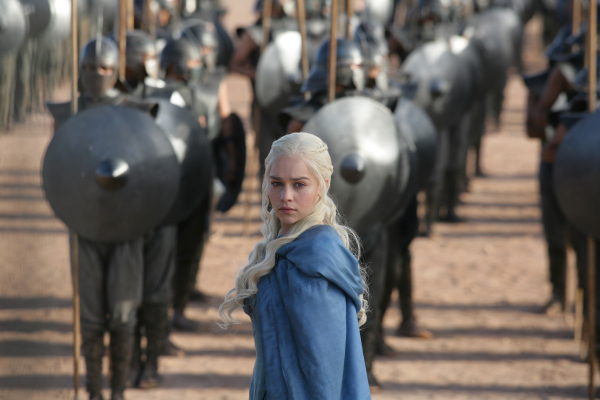 Daenerys meets her potential army, but still struggles with morality and other barriers to success in politics. Jon Snow joins the Wildings—but we knew that. The King-beyond-the-Wall Mance Raider is introduced, played by Ciarán Hinds. (He’s always spot on in whatever role he takes, though I have a soft spot for him since he played Ceaser in the underrated series Rome.) The Onion Knight survives the Battle at Blackwater and makes his way back to Stannis’s court—and is promptly carted off to the dungeon in my least favorite subplot. (I know it’s necessary. I just don’t care.) Sansa and Littlefinger talked about something. There’s was a lot of talking about something. It will come as no surprise that the Lannisters once again collectively stole the show. Though Peter Dinklage has rightfully become the face of Game of Thrones, both Tywin (Charles Dance) and especially Cersei (wonderfully played by Lena Headey) contribute to this family’s charismatic dominance over the series. The tense exchange between Twyin and Tyrion over the latter’s birthright stood in marked contrast the relatively unimportant dialog in every other scene of tonight’s episode. To some extent, the openly hostile relation between Tyrion on one end, and Cersi and their father on the other provides the show the closest it gets to a hero vs. villain scenario. The Lannisters, after all, are not really the villains here—just Tywin, Cersei, and, of course, Joffrey. But Tyrion is certainly no villain, simply a man trying to play the hand he was dealt. Even Jaime is on the road to redemption. Jaime’s redemption will be a subplot throughout this season and the next—which makes his and Brianne’s absence from tonight episode notable. In fact, neither Arya nor Bran made an appearance. I hope the absence of the two Stark children and Jaime are not indicative of how this season plays outs. Theirs are among the more interesting stories in the book. This review may be negative, but it’s lovingly negative, these are but the gripes of a fan. And since I have no intention of rereading the source material, I will continue watching.